Throughout the history of scientific discovery, many of the most notable contributions to the advancement of science arose from serendipitous roots. That does not necessarily imply that scientists stumbled across their discoveries by accident. More likely, what became clear to them was the result of a laborious and systematic approach, often based in collaboration, intuition and creativity. Such was the case with Victor Hess. 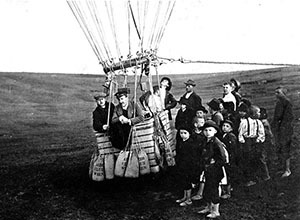 Victor Hess was an Austrian physicist who, in a series of experiments from 1911 to 1913, commanded a hydrogen-filled balloon on a first of its kind scientific expedition. 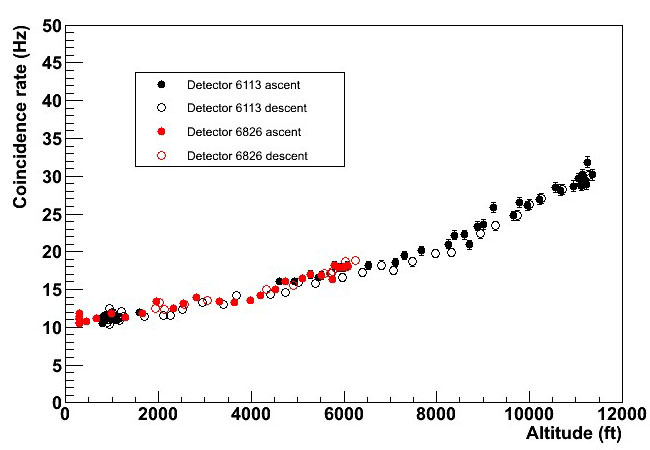 Measuring ionizing radiation at altitudes of over 18,000 feet from a hydrogen-filled balloon in the Austrian Alps, Hess serendipitously and unexpectedly found that radiation increased with altitude. Physics and Astronomy Outreach committed to re-enact Hess' experiment using modern technology – our own QuarkNet cosmic ray detectors and, of course, a hot air rather than hydrogen-filled balloon. We recruited a team of QuarkNet teachers and students to measure cosmic rays across a range of altitudes the same way Hess did – from the open basket of a balloon. This commemorative flight provided an exciting way for us to engage teachers and students, to reinforce the serendipitous nature of scientific discovery, and to use real data to teach fundamental concepts of cosmic rays and particle physics. Unlike a recreational hot air balloon ride, which may reach altitudes of only a couple thousand feet, the altitudes we needed to attain and terrain we would cross, qualified our mission as a cross-country flight. This meant the filing of a flight plan with the FAA, and down to the minute tracking of winds and visibility. In the months of preparation prior to the flight, our participating students tested the out detectors, power supplies, and data collection software against sudden changes and extremes in temperature and pressure. While the duration of the actual flight was approximately 90 minutes, crews, pilots and participants assembled and we began our work hours before sunrise, the most opportune time for hot air balloon ascensions. The three teams of students and teachers gathered with our pilots before dawn at the Metropolitan Airport in Fishers, Indiana, on a cold March morning with temperatures hovering just above freezing. We lifted off at approximately 7:45 AM. 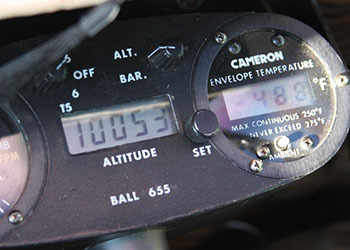 Our target – an altitude of 10,000 feet, almost two miles above the surface of the Earth! 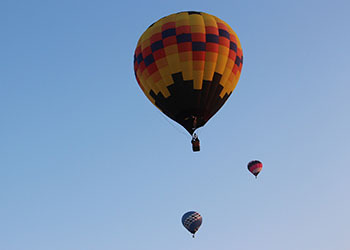 After months of planning, testing, refining, and preparing, Physics and Astronomy Outreach successfully launched three manned hot air balloons in a celebration of the flights during which Victor Hess discovered cosmic rays. 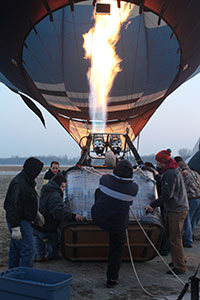 ﻿Our flight consisted of the combined use of three hot air balloons, the first of which carried Purdue Physics senior Chris Kraner and McCutcheon High School student Stephen Claypool. The student pair recorded measurements of cosmic ray data through the duration of their nearly two hour flight, from ground elevation to just over 10,000 feet. 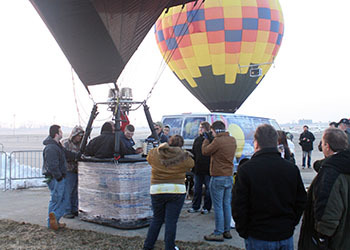 A second balloon carried Winamac High School teacher Jeremy Wegner and Purdue Physics Professor Matthew Jones, who directs the Purdue QuarkNet Center. 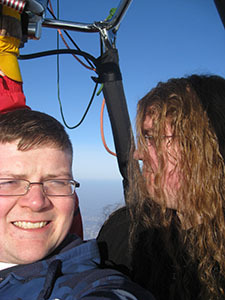 Wegner and Jones, whose balloon attained altitudes of approximately 6,000 feet, also collected data during their flight. David Sederberg, Purdue's Physics and Astronomy Outreach Coordinator, followed in a third, smaller chase balloon to video record the event. "Among the many challenges in orchestrating the flight," recalled Sederberg, "were the altitudes we wanted to attain to collect our data. 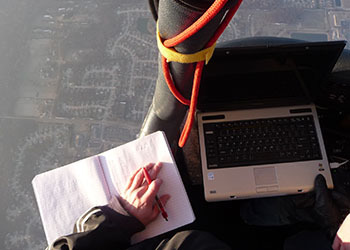 That took us into the realm of cross-country ballooning and significantly increased the amount of planning and the level of commitment and expertise required of our pilots." The data sets, collected in both ascending and descending legs of the flights, all clearly and consistently indicate the muon flux increases with altitude, confirming Hess’ findings from 100 years before. Data for the mission were recorded using our QuarkNet scintillation detectors, the very ones provided to our teachers for use in their high school classrooms. The software interface for processing the data was initially developed by Frank Roetker, working under the direction of Purdue physics Professor Matthew Jones. At the time, Roetker was a high school senior doing a summer research internship with QuarkNet at Purdue. Our Centenary Flight of Victor Hess provided a very unique opportunity for teachers, students, and Physics and Astronomy faculty and staff involved, as none had ever been in a hot air balloon before. It also provided our balloon pilots a chance to do something that stretched and extended the envelope of their experience, giving them the opportunity to do something they had never done before! 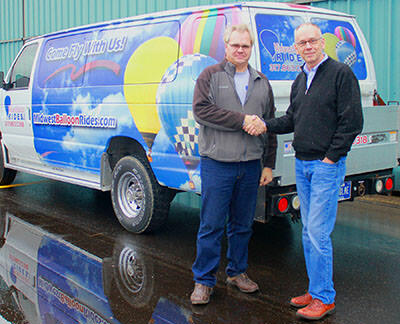 We remain extremely grateful to our enthusiastic balloon pilots, Tony Sandlin, Mark Westra, and Mike Nelson, for their professional and technical expertise and their undying commitment to the fulfillment of our dream and the success of our project!